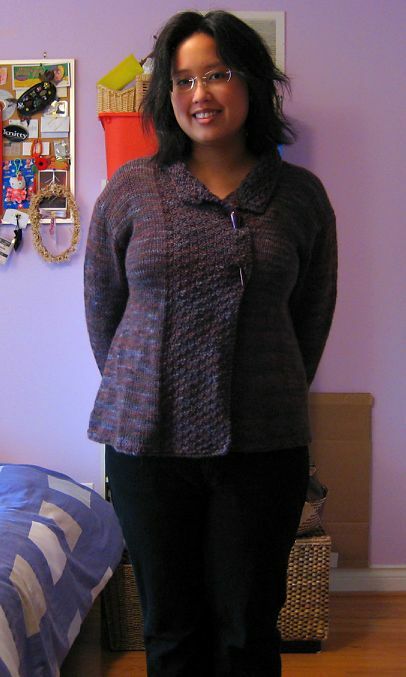 Oh wait…I do have a finished sweater! Okay, so the photo kinda blows. But I didn’t want to take another – who knows when there’ll be more daylight? Pattern: Oh, you know the one…the one everyone’s been making! Drops Jacket 103-1, in the aran weight pattern with long sleeves. So. The knitting was really fast, but, you know, gift stuff got in the way. 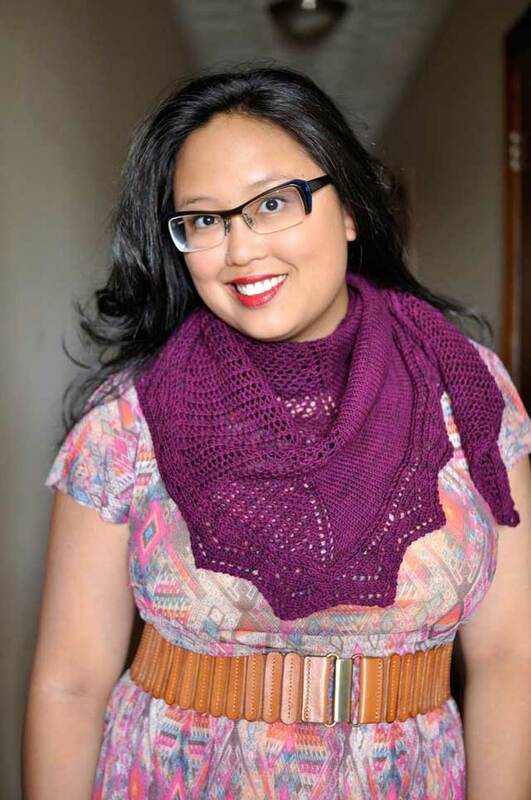 I’m actually pleasantly surprised at how this turned out – it’s really easy to wear, flattering, and warm (yay alpaca). I love the colours, too – sort of a plummy-purple-brown mix. No buttons yet (see a theme around here?) but of course, I’m a fan of the sweater stick, so no big hurry. I think I would like to put some buttons on for the security when it’s closed, but I also like being able to adjust the overlap when I wear it. Collar doesn’t really stand up like in the photo, but that’s okay – I think it might be a bit chokey for me (and maybe itchy). Great sweater – and gotta say, I love the new hair! It looks great and I love the colours, too. You mention that the collar might be itchy if it stood up. Do you find the Aran Alpaca to be scratchy at all? I’m thinking of making either the Celtic Cardigan or Imogen and wondering which yarn might be softer. Hey, I’m making that, too! (Along with 500 other people.) Thanks for showing the FO. Looks nice! That sweater is gorgeous! The fit and the color are perfect! I really love the color variations in the yarn, too. It gives it an almost striped-effect without being overpowering! another winner! i’d like to try a sweater stick but am scared i’ll stab myself!! I think the photo is fine! Love the cardigan, the yarn is scrumptious and it fits you so well! Applause! I became a fan of your sweater sticks ! I’ll use it for the cardigan I’m working on right now. Thanks for inspiration ! Hey that looks great! I like the collar folded down better than the original. And it looks awesome on you, too. Love this cardigan. The colour is perfect and I usually love the mixed colour. I like your version better than the one shown with the pattern! It looks like your sleeves are full length and that shaping is so flattering on you! Ta veste est splendide ! I love this jacket! I’ve want to see it on someone, and it looks great!